We’re going to be frank: it troubles us when musicians don’t take care of their ears. Because hearing is super important seeing as it’s the basis of what we do. But, as important as hearing is, how many of us actually know how it works? Physically, mechanically, acoustically? Let’s talk about how sound enters your ear. We have, of course, the external part of our ears. Without getting into it too deeply, this part of our ears channels sound vibrations into the ear canal. 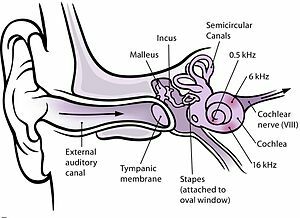 The ear canal , also known as the external auditory canal, leads from the outer ear to the middle ear. Incidentally, the ear canal itself has a resonant bias in the frequency range of 2k Hz to 7k Hz, which means that our ears are attuned to the frequencies of human speech. As the ear canal channels this air fluctuation, it causes the tympanic membrane (illustrated right) to move. The membrane vibrates with the compression and rarefaction of the sound wave: moving inward with the compression phase, and outward with rarefaction. 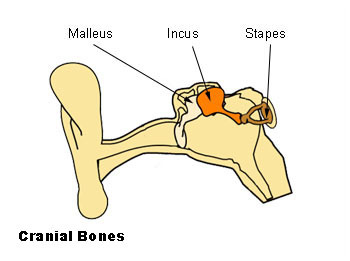 Wikimedia Commonscauses the ossicles ( 3 tiny bones in the middle ear: the the malleus, ) to move. This in and out motion in turn causes the ossicles (three tiny cranial bones in the middle ear: the malleus, incus, and stapes) to move. These bones act as complex levers have to concentrate the force applied to the relatively large surface area of tympanic membrane to suit the relatively small opening, the oval window, that leads into our inner ears. Specifically, the oval window opens into the cochlea. The cochlea, an organ that looks kind of like a snail shell, is where the mechanical energy of the sound’s vibration is converted into a neural signal. 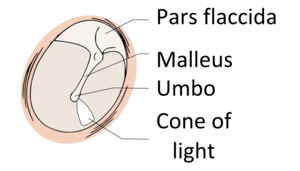 The cochlea is hollow and filled with fluid and lots of different things that are anatomically fascinating, but we won’t really discuss in this post. 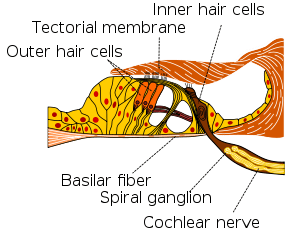 One thing that we will talk about, however, is the basilar membrane, which is suspended in the cochlea. When sound waves enter the cochlea’s oval window they resonate the fluid inside, producing standing waves. This process decomposes complex sounds into their simplest, sinusoidal components. These standing waves adhere to distinct locations along the basilar membrane: locations which are determined by the waves’ frequencies. As seen at right, the lower the frequency the larger the amount of space on the membrane the standing wave takes up and vice versa. 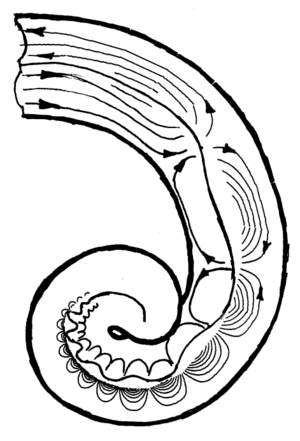 These sinusoidal standing waves cause the basilar membrane to move and thus cause the hair-like structures on the organ of corti to vibrate as well. The organ of corti contains several layers of hair cells, and the nerve endings on these hair-like structures is where the actual transduction from mechanical energy to nervous impulse takes place. 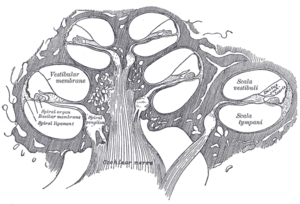 We talk about transduction possibly too much, but this is an important topic! Make note here, because this is how a sound vibration is translated into a signal the brain can understand. This neural signal is sent to the brain’s stem and cerebral cortex, where it interprets sound. The anatomy of hearing as well as the study of the ear is its own science, and we’ve just barely the surface. Check out the links and some related articles for more!